For many years, there was no realistic way to model SP stock cars, short of scratchbuilding or extensive kitbashing. Then the Westerfield resin kits came along, with masters by Frank Hodina. Since Frank made those masters before anyone told him that “everyone knew” you simply couldn’t cast stock car sides in resin, he was unaware of the “impossibility” and made them anyway, and Al Westerfield produced kits from them. Those kits are time-consuming to build (and are still available), and were a landmark because at last there were accurate SP stock cars. Then, of course, as probably everyone knows, Red Caboose did one SP stock car class, S-40-5, in styrene. This post is mostly about those cars. Below is a prototype photo of a car from Class S-40-5, taken at Dunsmuir in 1928, from the Shasta Division Archives. End lettering is so faded as to be almost invisible, though the car has been repainted since its construction in 1916. Trucks are Vulcan. The Red Caboose cars are in large part beautifully rendered from the prototype. One reason they chose this particular car class is that there was a good drawing available. The entire class of over 900 cars (a large class as stock cars go) was built with Vulcan trucks. And here lies one of the issues with the Red Caboose model — most model cars were assembled with T-section trucks. 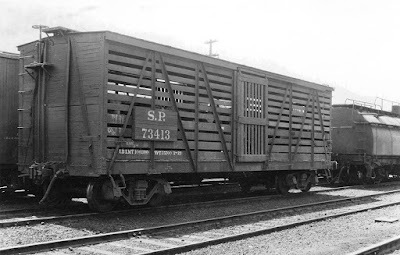 Some later SP stock car classes did receive such trucks, but I know of no photo nor SP Freight Car Ledger entry showing an S-40-5 car with T-section trucks. So an early fix applied by many modelers (including me) with the Red Caboose model was to substitute Vulcan trucks. I have mostly used the Kadee No. 515 trucks for this, a sprung metal truck. Kadee has not yet released this truck in a HGC or High Gravity Compound version (which are better looking by far), so for the time being, the 515 truck is the one to use. I usually replace the Code 110 wheelsets with Code 88 wheels on my cars. I should also mention that those who have attempted to operate the Red Caboose cars with their original trucks have had a lot of problems. These appear to stem from the fact that the trucks are designed to be equalizing, with the side frames able to rotate somewhat relative to the bolster around an axis parallel to the bolster long dimension, and in practice that rotation is insufficiently free. Trucks get cocked so all wheels don’t sit on the same plane, and that’s an automatic derailment waiting to happen. Two solutions have been tried that I know of: to try and free up the rotation part, or to give up on rotation and glue the truck parts into a rigid, single piece. I know one experienced and skilled modeler who tried both, and did not feel either one was successful. But others claim good results with the glue approach. As I mentioned above, though, I use a third solution: replace the trucks altogether. My current standard for car trucks is to discard all Red Caboose rotating trucks immediately. 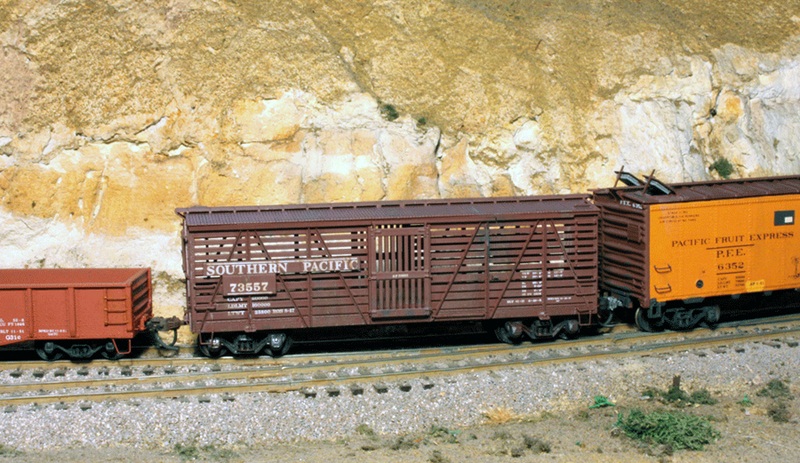 Here is one example of a Red Caboose stock car I own, SP 73557, shown in a train on the layout. It has Kadee Vulcan trucks. I have a single Northwestern Pacific stock car from the Red Caboose fleet; NWP only received 60 cars in Class S-40-5, but there is evidence that these cars roamed the SP throughout California, so it seemed all right to have one. 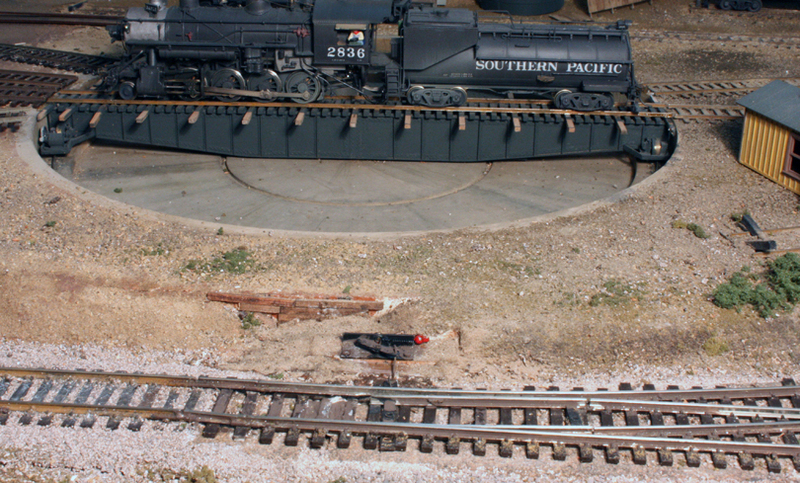 It’s shown below next to an SP stock car, which has the very nice detail that Red Caboose included, the long letterboard from when the road name was spelled out (as in the photo just above). But the SP car shown below has not had its T-section trucks replaced yet, nor does it have a reweigh date, so it’s not quite ready for service. I also have a single Westerfield stock car in service, modeling Class S-40-8. Though that class had only half as many members as S-40-5, and the body was very similar to the -5 design, one difference is that there were open slats at the top of the ends. Ends on Class S-40-5 are entirely closed. The -8 class was built by Pullman, mostly in 1924, and was delivered with T-section trucks from American Steel Foundries (not Bettendorf). By the 1950s, though, photos as well as Car Ledgers show that some cars received replacement cast-steel trucks with U-section sideframes, and I modeled my car that way. Since I have a stock pen at East Shumala on the layout (see, for example, http://modelingthesp.blogspot.com/2015/06/the-east-shumala-stock-pen-part-2.html ), I do need a few stock cars to come and go, and also one or two to be stored there. 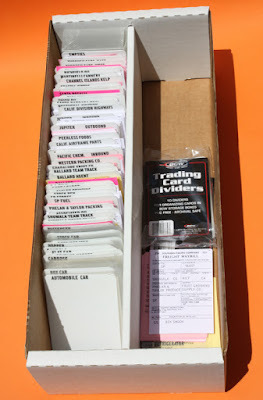 SP documents from the 1950s advise agents to store any empty stock cars, pending a request for them for loading, since there was a system-wide surplus of stock cars at the time. In most of my operating sessions there is indeed an empty stock car or two at the end of the stock siding. In the previous post in this series ( http://modelingthesp.blogspot.com/2015/07/modeling-highway-trucks-part-3-more.html ), I showed some trailers I had modified, and in the present post I want to show more, along with a van truck. These are in addition to the earlier work. I have received very helpful comments from a couple of modelers who are far more knowledgeable about semi-trailers and trucking than I am. One point made is that the Athearn 24-foot trailer is undersize (too narrow and a little too short in height), probably made that way so it would fit onto the Athearn flat car and operate on a range of model layouts. It is also awfully plain and far from typical of many 1950s trailers. 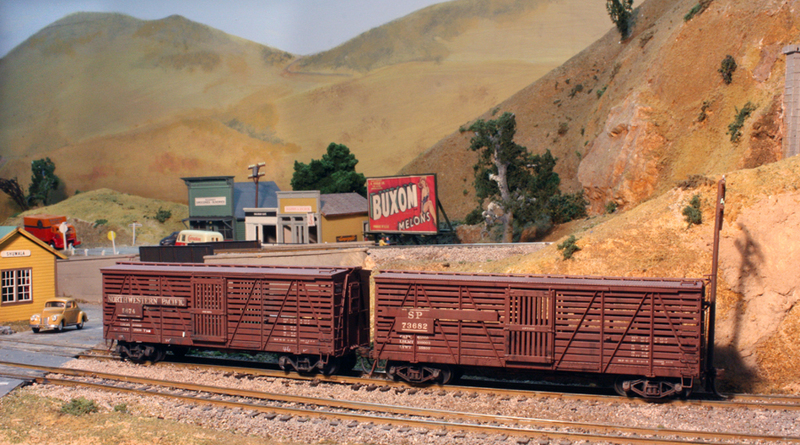 One approach to easy but effective modifications to these trailers can be found in Art Curren’s article in Model Railroader (November 1990), pages 120 and 121. Though not about superdetailing at all, Curren shows simple ways to get different trailer appearances. One can also be critical of the Ulrich van trailer as being rather simplified, especially with its totally smooth sides. Since I am mostly trying to get broadly realistic tractor-trailers on my layout roads, this isn’t vital to me, but I do realize that truck parts like correct mirrors, air-line connections, landing gear and other details can certainly be added to make a more detailed and more accurate vehicle. I will concentrate on tractors in subsequent posts. Those concerns aside, I proceeded to make up a few more trailers from both Athearn and Ulrich. As I have pointed out in previous posts, I find the many prototype photos at Hank’s Truck Pictures very helpful (see: http://www.hankstruckpictures.com ). Though many of the older photos are black-and-white, they do at least permit finding out if a company’s trailers were white or silver, by far the commonest colors in the 1950s. And again, I have depended greatly on the decorations available from Graphics on Demand (you can visit them at: http://store.graphicsdemand.com/ ), with Ken Goudy’s extensive prototype research behind these graphics. One truck type I wanted on the layout was beer delivery trucks. 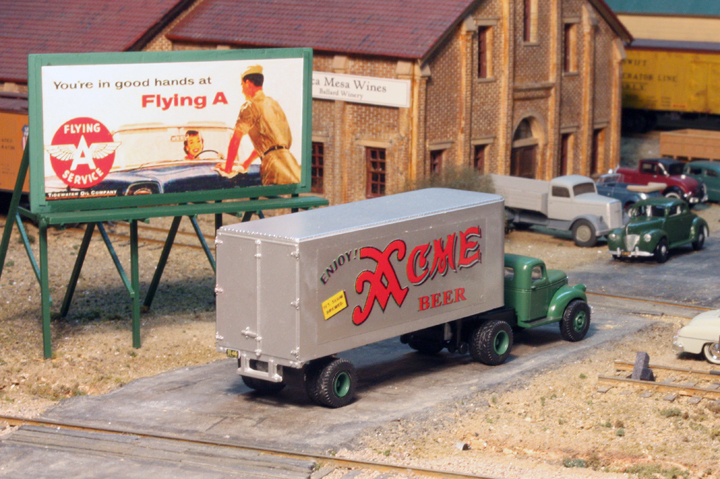 Graphics on Demand has a number of 1950s regional beer truck graphics. One I chose was Acme, and applied that graphic to one of the Athearn trailers. The tractor is a Classic Metal Works (CMW) 1941–46 Chevrolet, shown on Nipomo Street in my layout town of Ballard. Acme Beer has an interesting history (there is a fine summary at this link: http://brewerygems.com/acme.htm ) and as a San Francisco company fits well into my Central California modeling location. In 1935 they had added a brewery in southern California (Vernon) and continued operating both the San Francisco and Vernon breweries until 1954, when the plants were sold to Liebmann Brewing of New York (Rheingold Beer). Liebmann sold the Vernon plant to Hamm’s in 1957, and closed the San Francisco brewery in 1958. One of the trucking companies I wanted to include was California Motor Express, or CME. Luckily Graphics on Demand carries their earlier decoration, before they went to a graphic that looks like a truck. Here is that trailer behind another CMW tractor, on Bromela Road in Ballard. And yes, in both the foregoing photos you can see my interchangeable billboards in action. For more on that idea, you can read this post: http://modelingthesp.blogspot.com/2015/04/interchangeable-billboards.html . The tractor does lack side mirrors at this point. 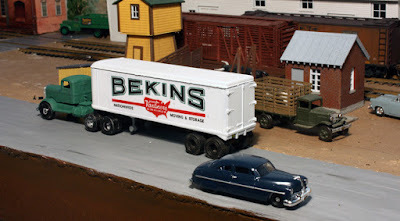 Another truck I wanted to have is a Bekins trailer. 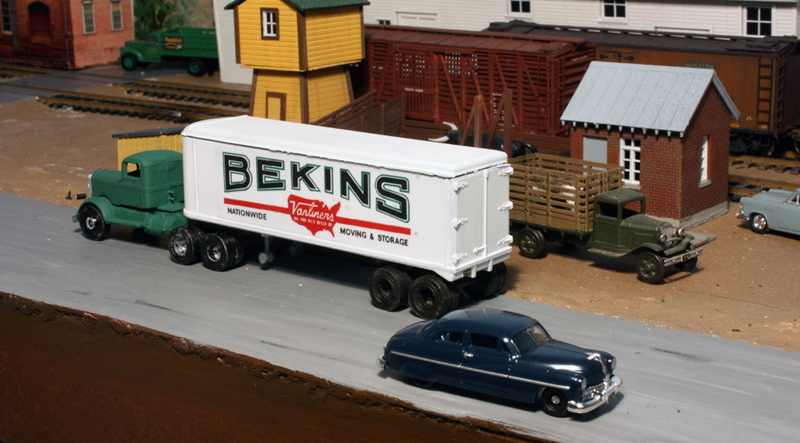 My uncle Joe worked for Bekins for years, and in addition to their moving-van type trailers (often with lowered floors), they had conventional trailers too. My model is the Ulrich trailer and Kenworth tractor. Here again, the decoration is from Graphics on Demand, shown on Pismo Dunes Road. These additional trucks have added to the variety on my layout, and I have been happy to be able to represent some Western trucking concerns as part of this project. I have a few more to do, which I’ll report one of these days. I have discussed a number of times in this blog my ideas about how to maximize both convenience and flexibility in a waybill system. You can search for specific parts of these topics using the search box just to the right of this paragraph, and with search terms including “waybills,” which is in the header for all the posts. You can also obtain the first 29 posts in this series in a PDF assembled by Mike White and available from a link on this blog post: http://modelingthesp.blogspot.com/2013/02/waybills-27-collected-posts.html . My most recent post about waybills explored the idea of “overlay” bills, and you can read it at this link: http://modelingthesp.blogspot.com/2015/06/waybills-part-41-overlay-bills.html . These are an important part of my flexibility ideas. The core concept here is that in the transition era, there were many cars that can be termed “free running,” that is, they could be confiscated for loading on any road, not just on their owner’s or lessor’s rails. 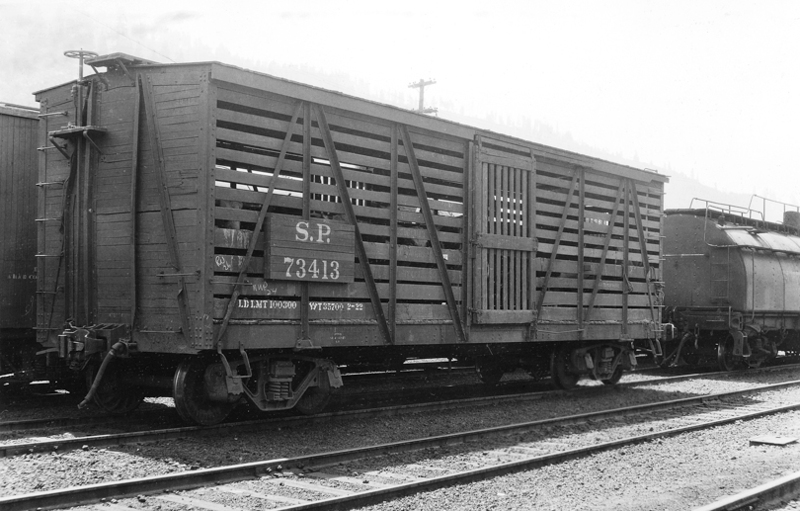 The primary group of this type was box cars, but many gondolas and flat cars were also free-runners. What that means on a layout is that a particular loaded car could arrive from almost anywhere in the country, and in turn could be reloaded outbound to almost anywhere (for the moment I ignore Car Service Rules, which I have also covered in prior blog posts). If a person is using car cards and separate waybills (or car sleeves and separate waybills, as I practiced at one time), the movement of cars just described is easily reproduced. Any waybill can be put with any car card (even steel beams in a tank car, if you don’t pay attention), and flexibility is as complete as you could wish. But the problem with those systems is that the waybills are not particularly prototypical (though Jeff Aley and others have made advances in the right direction). If you want realistic waybills, and I recognize that not everyone does, you need a different system. Several people have been developing various realistic systems in recent years. Dan Holbrook was really the pioneer here, as far as I know, and more recently Tony Koester, Ted Pamperin, and I have been among those trying to implement several refinements in these ideas. 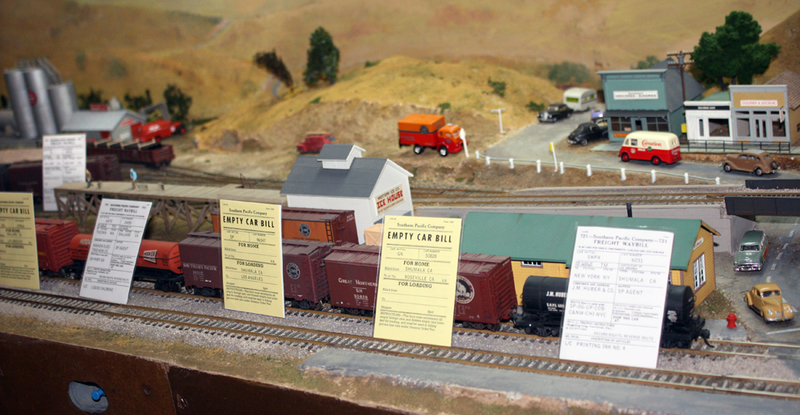 Here are a few of my current waybills, set alongside the corresponding freight cars on my layout, during an operating session. Actually, I prefer that operators not “decorate” the layout like this, but I know that making this arrangement can be a big help in making sure all cars and bills match up and are accounted for. The good news with “modern” waybill systems is that a very prototypical and realistic waybill can result, but the bad news is that it is for a particular car. If you wished to depict that same load arriving in a different car, you need an entire new waybill for the same load, but in that different car. In the old car card systems, only a single waybill for any given load was needed; in the realistic systems, you could need (in principle) as many waybills for that load as you have suitable cars, so that any one of your free-running cars could handle the load. If I roster, say, 100 box cars, you can see the dimensions of the problem. That’s where overlay bills come in. They allow more flexibility, though not as much as in the car card systems. I commented on that in the post which is linked in the second paragraph, above. Here I want to talk about the patterns with which I use these. Since I have lots of PFE cars and lots of outbound perishable loads, overlay bills work very nicely with these cars and loads. I have also created a lot of overlay bills for outbound boxcar load, naturally all SP waybills like the perishables, and again, it gives me good flexibility. But there are still further issues to confront. The first problem I have found with waybills tied to specific cars is to implement my system of car movement scheduling. Waybills are all very well by themselves, but which ones are chosen, at which times? Answering that calls for a schedule — though of course you can just pick and choose by eyeball if you wish. My system, which is a version of what is properly described as “demand-based car flow,” was described earlier (see this post: http://modelingthesp.blogspot.com/2011/11/operations-demand-based-car-flow-2.html ), and I even devised an approach which can allow randomization of the sequence of waybills if desired (that post is at: http://modelingthesp.blogspot.com/2011/11/operations-demand-based-car-flow-3.html ). Some of the old “car sleeves” remain in this file, as you see by car type in the foreground area. But of course they are not part of the problem I’m discussing. 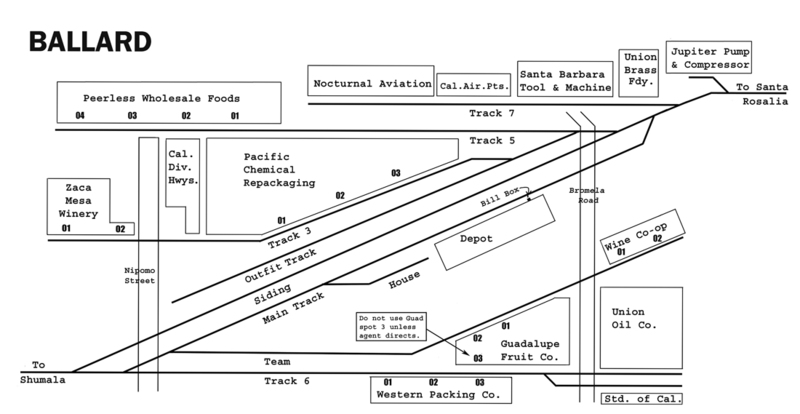 So far my efforts to marry the waybill file, shown above, with an incomplete “master roster” of all stored freight cars, is working all right, but that roster needs to be completed. At some point, I will likely publish another post to show how that works. As seems to work on my smallish layout, I assign two crews of two each, one to start switching at Shumala, the other at Ballard on the opposite side of the layout, and when each each crew is done, they will have made up a train to go to the other side. When those two trains run, the two crews can exchange sides to switch out the cars that have just arrived at the new destination. 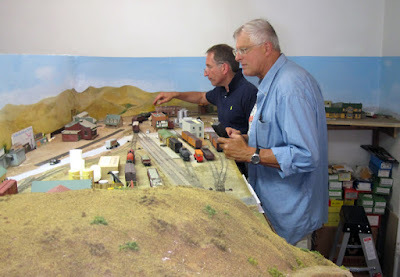 On Saturday, the crew which began at Ballard was Jim Providenza and Paul Weiss, both of whom are certainly operating experts as well as experts at layout maintenance — the latter point leading to suggestions on their part about solutions to some of my glitches. In the photo below, you see Jim (foreground) holding the throttle because he’s engineer on the local, but looking ahead to see where the next car pickup is, while in the background Paul, who was conductor here, appears to be nudging a stalled locomotive. On the Shumala side, meanwhile, Clifton Linton and Lisa Gorrell were at work. As you can see, Cliff has the paperwork and is planning switch moves (he made good use of switch lists to organize the job), and Lisa is engineer of the diesel switcher. Most everything went well. The waybill scheme was effective and there were only a couple of cars which acted up during operation (all were pulled off for maintenance). Locomotives worked well, but we had some electrically balky turnouts, only some of which we could diagnose. It is always baffling when a turnout which worked fine in the morning when I made one last pass over the trackage, starts acting up in the afternoon when guests arrive. (Yes, I know, there’s a well-known adage that “guests cause sleeping gremlins to wake up,” and my experience obviously provides more data in support of that saying.) Just one of those things. But it was well worth the experience to get expert advice, especially from people like Jim and Paul, both of whom have torn out track on their own layouts at times, to rebuild and make it better. For simplicity, I’ve only shown the Saturday crew, though I re-staged overnight and a different crew operated much the same session on Sunday. Once again, I got good advice on trackwork maintenance from experienced layout owners who were there, as well as helpful comments on the operation scheme. So in addition to the fun of putting the layout to work, both days I identified problems as well as solutions on the layout. In a way, I was a little discouraged that we did find problems, which I hadn’t found in advance, but as Jim Providenza reminded me, the layout in its present form has been operated in a formal way relatively few times, and as he put it, “remember, it’s still early days.” So I have some fixes to implement, and next operating session, at least some of the demons will be exorcised. And not to forget, we will continue to have fun doing all the switching. That part worked just fine. There have been HO scale automobiles for decades, and of course I can’t begin to provide any kind of overview or summary of these. Instead, I will just mention a few recent projects of my own. Today, modelers are very familiar with the generally fine replicas made by Classic Metal Works or CMW (“Mini Metals”) and by Acme. In this post, I go beyond those. Below are a selection of kits and complete vehicles, somewhat randomly selected, from my stash of vehicles. I am including light trucks here. 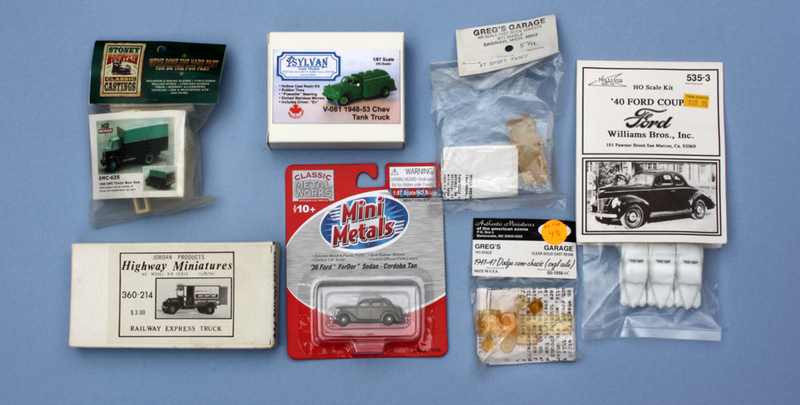 From left to right, they are, in the top row, a Stoney Mountain model of a 1938 GMC box truck, a Sylvan Scale Models 1948–53 Chevrolet tank truck, a Greg’s Garage 1946 Pontiac “Streamline,” and the Williams Bros. set of three 1940 Ford coupes. 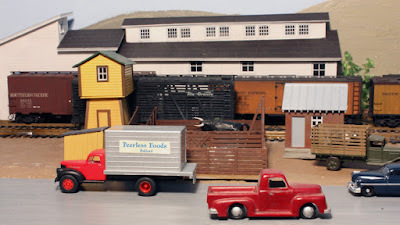 Below are a Jordan 1929 Ford Model A Railway Express truck, a CMW 1936 Ford sedan, and a later Greg’s Garage model of a 1941–47 Dodge truck cab and chassis. The Sylvan line is especially large and impressive and well as accurate, and I recommend them if you don’t already know them (you can visit them at: http://www.sylvanscalemodels.com/ ). Greg’s Garage was originally in Saginaw, Michigan, when founder Greg Brown ran it, and later was in Burtonsville, Maryland under new ownership. Stoney Mountain makes a variety of products and is on the web at this link: http://www.stoneymountaincc.com/ . The advantage of all these vehicle kits is that they provide variety. I model 1953, but as I well remember from my teenage years, there were still plenty of cars around from previous decades. Several of these kits are resin castings, using clear resin so that the windows look open but the body is a simple, one-piece casting. The Williams cars are hollow moldings, so window glass, if desired, would have to be added (perhaps with Microscale “Krystal Klear” or canopy glue). The Stoney Mountain kit is opaque resin, so a choice of dark window color has to be made. These models can generally be brush painted (for the clear resin ones) or airbrushed. A key point on finishing, especially automobiles, is the chrome trim. 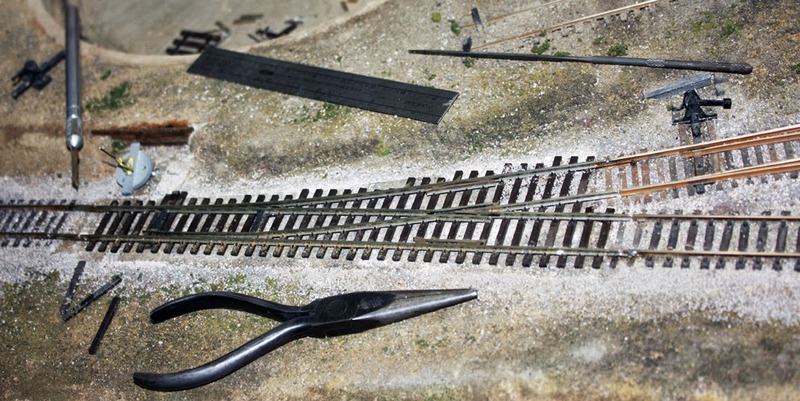 It is so small in HO scale that it really is not possible to do with a brush, even the very smallest size. A great tip I learned from building a Sylvan Scale Models kit is to use a toothpick to apply the silver paint. Simple and works great. I of course apply 1953 California license plates to my autos (along with a few out of state plates), as I have described before. One blog post on this topic is at: http://modelingthesp.blogspot.com/2012/11/vehicle-license-plates-in-ho-scale.html , and I have more discussion of it in my upcoming column in the August 2015 issue of Model Railroad Hobbyist. 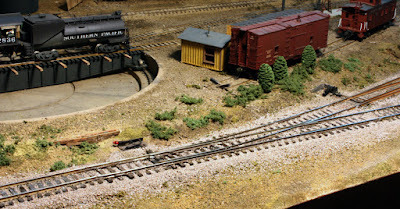 I will just show a few examples of vehicles on my layout. I didn’t include any Magnuson Models vehicle kits in the photo above, though I have built their 1948 Ford coupe and the 1953 Chevrolet. I especially like the latter car. My dad bought one new, and it was the first car in which I was allowed to drive by myself. So I felt obliged to paint it in the two-tone green and yellow scheme that my dad’s car had. Here it’s on Chamisal Road in my layout town of Shumala. One make of model car that is easy to build is the Williams Bros. type, which are simple moldings. Though not superdetailed, they do have interiors and open windows. 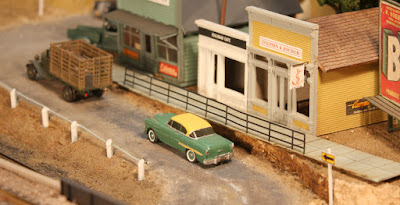 Here is one of the 1940 Ford coupes, on Nipomo Street at the town of Ballard on my layout. In the background is one of my interchangeable billboards, the concept and construction of which I described briefly in a prior post (see it at: http://modelingthesp.blogspot.com/2015/04/interchangeable-billboards.html ). I mentioned the familiar CMW vehicles above, and to many modelers they are attractive because they are ready to run (with, perhaps, the addition of license plates). The same is true of Oxford Diecast, which has produced several nice HO vehicles that I could use. And there are several European makers which occasionally produce a North American vehicle. Another maker worth mentioning is Alloy Forms, producers of metal kits, at one time, and ready-to-run vehicles. Here is their 1948 Ford convertible, a very nice model car to park in a prominent location, like the parking area at my Ballard depot. I especially like the period whitewall tires. Behind the convertible is a 1949 Studebaker “Commander,” also from Alloy Forms. I mentioned the Greg’s Garage kits above, which are clear cast resin and require only painting and the addition of the wheels which come in the kit. Here is the 1946 Pontiac “Streamline,” shown at the section house on my SP main line. That’s a Dyna-Models 1947 Ford pickup truck behind it. The point I hope I am making is that there are really a lot of HO scale vehicles out there, past and present, and the kits are well worth a look. They offer access to automakers and years not otherwise available. I built a new grade crossing into this road to serve an additional industry (described here: http://modelingthesp.blogspot.com/2014/08/a-new-grade-crossing-in-ballard.html ), with the completion shown in a following post (a link: http://modelingthesp.blogspot.com/2014/09/new-grade-crossing-ballard-part-2.html ). That’s the spur at lower right, to the Standard Oil dealer. In the map above, Bromela Road crosses the main and siding tracks, then makes a vaguely defined turn to the left between tracks 5 and 7. It was always my intention to make some kind of extension of the road along that alignment, but it’s never really come together. Partly to prepare for my idea of adding a truck dump alongside Track 5, I decided to go ahead with building this road extension. I chose to use styrene for this roadway, a material I like. I have shown my method with this material earlier, when building Pismo Dunes Road (see: http://modelingthesp.blogspot.com/2015/02/pismo-dunes-road-part-3-alder-street.html ), and would not repeat it, except that in the case of the Bromela Road modeling, I needed to generate a smooth transition between two levels of scenery. Pismo Dunes Road is level on my layout. I began by taking a sheet of newsprint and working on the layout itself, I cut out a a variety of road sizes and shapes until I was happy with the way one of them fit the space. Then I used the paper pattern as a guide to cut a piece from my large sheet of 1/16-inch styrene and primed it with Testor’s Aircraft Dark Gray. The paper pattern (top) is shown alongside the primed styrene piece. There is a deliberate narrowing of the road, to force a little perspective. 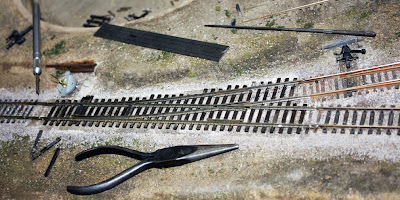 Once the primed styrene was ready, I mixed up a generous batch of Sculptamold to act as a glue for the roadway piece, spread some under the path of the road, and pressed the styrene into it, adjusting to get a smooth vertical curve. I then weighted each end of the styrene so it could set up. In the view below, I think you can detect that there is a grade in the road, climbing toward the background scenery level. Most roadway edges were also blended with Sculptamold. Weights here are a small anvil at left, and a slice of a lead ingot at right. In the center of the photo, the first stage in making the truck dump ramp can be seen. With this step completed, and the roadway well glued to its location, I made another batch of paper mache, this time the Brandt’s Taxidermist’s material, which with its finer grain makes a smoother surface. (There are many comparable paper mache products for taxidermists, all over the Internet; here’s just one example: http://www.mckenziesp.com/Maches-C4869.aspx .) I completed blending the road shoulders, and also faired the new roadway onto the adjacent road areas. With the contours looking all right alongside the roadway, I painted all the shoulders with Rust-Oleum “Nutmeg” and the roadway itself with gray primer. Now the road was looking much better, even though the “asphalt” color still needs improvement! 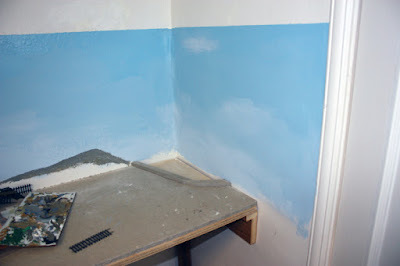 To me, this primer color is too bluish and needs to be warmer. But the smooth road contour as it climbs upward is what I wanted. The track in the background is simply lying in an approximate location of where Track 7 will eventually be. All that remains now is scenic treatment of the shoulders, and better road paint. The truck dump also needs development, but that is still a ways off. 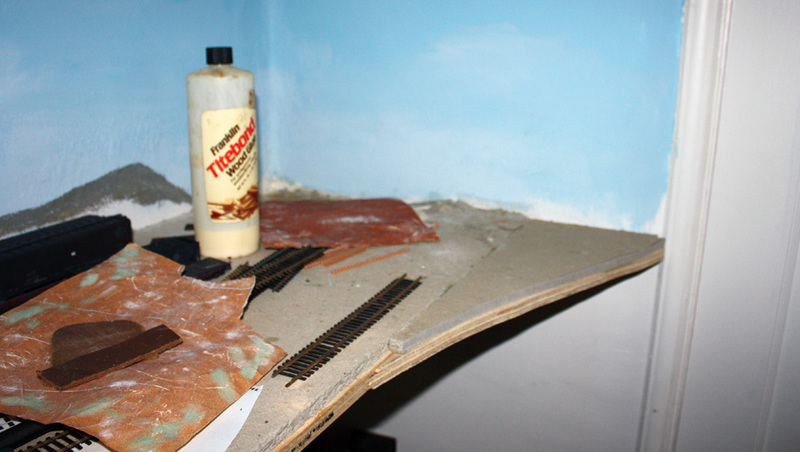 I have shown a number of parts of the construction of my layout town of Santa Rosalia, the end of my SP branch line. You can readily search for them using the search box directly to the right (this page), and the term “Santa Rosalia.” The last time I showed the under-construction status was in this post (link: http://modelingthesp.blogspot.com/2014/07/constructing-santa-rosalia-waters-edge.html ), in which I showed the the corner of the room, into which the branch extends. Here is that photo, repeated. Right in the corner is my future harbor area. 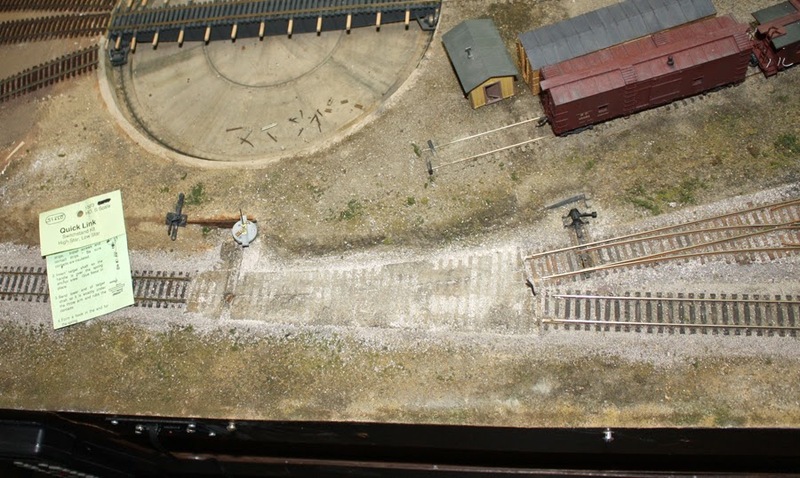 You can see that there is some space at the right edge of the layout as shown here, reaching to the edge of the doorway. I decided to use that space. First step was to glue a splice plate underneath the existing plywood track board. With that done, I experimented with newsprint to make a suitable shape of the new layout addition. 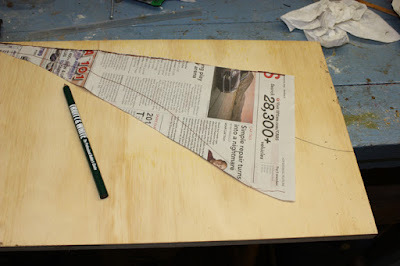 Below is the final paper pattern, lying atop the 5/8-inch plywood sheet from which I would cut out this piece. You can see at right the pencil outline of the pattern that was traced on the plywood. Once this plywood piece was cut out, the next step was to glue it atop the splice plate attached earlier. As before, I used yellow carpenter’s glue. You can see how the structure now fills all the space over to the doorway. With the plywood base installed, I used the same paper pattern to cut a piece of 1/2-inch Homasote to match. As always with Homasote, I used a Utility knife for this. 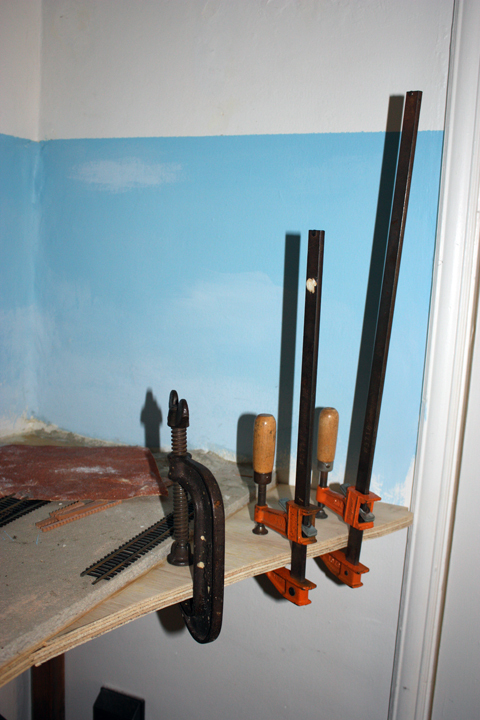 Cutting Homasote with any kind of saw is a good way to generate lots of fluffy dust, but otherwise undesirable. Here is the result. 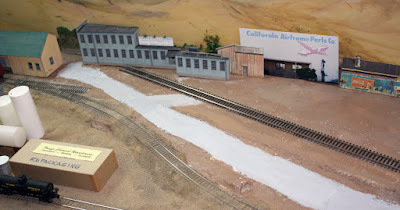 As things have progressed with the Santa Rosalia harbor area, and with other aspects of development, such as the cannery and the depot (see for example the post at: http://modelingthesp.blogspot.com/2015/05/sp-depot-santa-rosalia-part-4.html ), I’ve completed painting the area with my favorite “ground” color, Rust-Oleum “Nutmeg,” and currently it looks like the photo below. Against the wall are the fish cannery and (at left) Pismo Marine Services (these two buildings, both kitbashed, were described previously at: http://modelingthesp.blogspot.com/2015/05/kitbashing-santa-rosalia-cannery.html ). The Common Standard no. 22 depot (an American Model Builders kit) is in the center. The house track curves behind the depot. The white Xerox copy in the foreground is the plan of the Peco three-way switch that will be placed there. 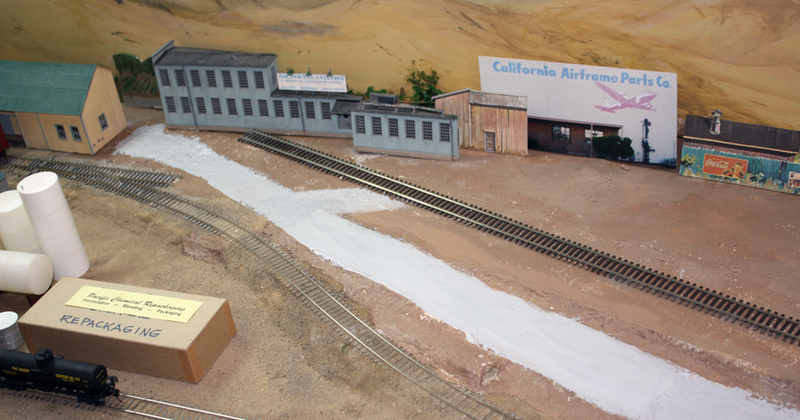 Track laying is progressing in Santa Rosalia (see a prior news item on this: http://modelingthesp.blogspot.com/2015/05/flash-tracklayers-enter-santa-rosalia.html ), and the placement of roads, additional industrial buildings, and scenery will be happening soon. Back in 2012, I posted a series of descriptions of how I was dealing with electrical problems that were emerging on my layout (beginning with this one: http://modelingthesp.blogspot.com/2012/09/electrical-wars.html ). More recently a new problem surfaced with one of my Shinohara turnouts at Shumala: from time to time it caused a dead short when set normal, but only on a few occasions. The rest of the time it was fine. I have trouble-shot this thing enough times to have walked to Seattle, but simply could not find why this short occurred, and probably it only occurred about a fifth of the time or less. Solution? Rip it out and put in another one. I should emphasize that this isn't really a criticism of Shinohara turnouts — this turnout has been in place, and in use, for more than 30 years, and the problem has only appeared in the last few months. Just at the throwbar location is a Star switch stand, and its green packaging at far left. Note between the two is the old Caboose Industries “high-level” throw (model 204S), which I wanted to replace with the Star throw. I should hasten to say that the 204S has functioned flawlessly for over 30 years, but it is the only such throw on the layout. I would like to cut down on the variations in equipment. One part of that previous series of electrical posts presented some of my views about hand throws for switches (you can read that post at this link: http://modelingthesp.blogspot.com/2012/09/electrical-wars-part-3-hand-throws.html ). As I mentioned in that post, I am steadily replacing the old Caboose Industries 202S ground throws with what I think is much better, the Bitter Creek B-4001 throw. I finally decided I was better off to install the Bitter Creek throw at this location than the Star, just for consistency elsewhere (there are half a dozen Bitter Creek throws already at Ballard, and more planned as replacements for Caboose Industries 202S installations). With the new Shinohara switch in place, here is how it looked. And once properly gapped and fed, it functioned correctly electrically — what a relief! With the trackage aligned, I installed the Bitter Creek ground throw. You can see it below at the switch throwbar, and it’s evident how much less obtrusive it is than, say, a Caboose Industries throw. 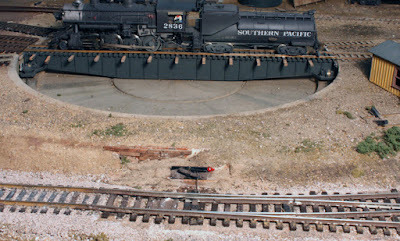 In the background is one of my Southern Pacific C-10 Consolidations on the turntable. The Bitter Creek mechanism itself is small, and though it is supplied painted black, I usually paint it a medium to dark brown, as you can see here. This blends in even better than black. At this point, soil has been added in the area, but no vegetation as yet. 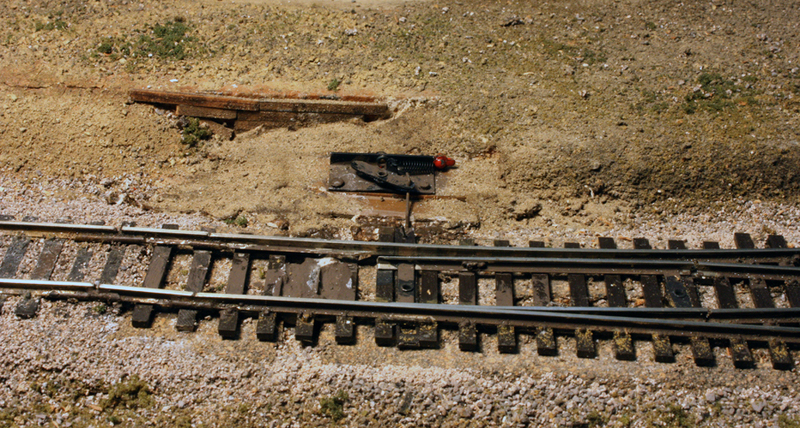 Once the switch was functioning well mechanically and electrically, I could continue to scenic around the ground throw and ballast the track. The current appearance is like this. Toward the right you can see a Caboose Industries ground throw (a better view is in the second photo from the top of this post), which can be compared to the Bitter Creek throw at lower left. 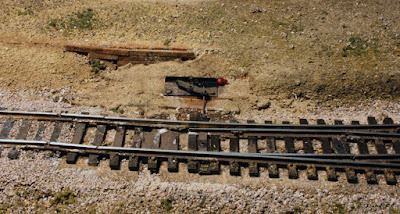 The Shumala caboose track is at upper right, with a Westerfield “temporary” box car caboose at the end of the track nearer the camera. As I mentioned, I really took a deep breath before tearing out a switch in this location, but it was worth it to solve the electrical problem with the old switch (whatever it was). And since this switch is the portal to most of Shumala’s trackage, I had plenty of motivation to move along smartly on the project. I’m glad I did it. 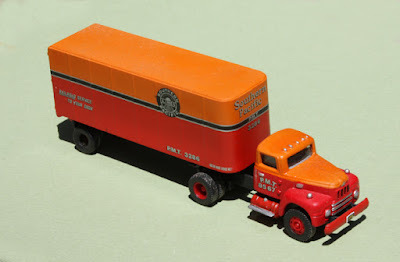 I began this series of posts with a discussion of straight or box trucks (see: http://modelingthesp.blogspot.com/2015/07/modeling-highway-trucks-part-1-box.html ). 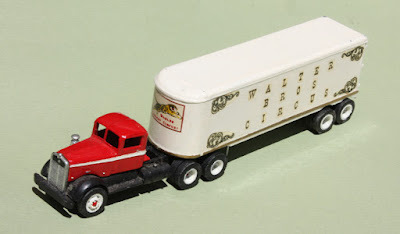 The second post was an introduction to modeling of semi-trailers, particularly Western ones (and that post can be read at this link: http://modelingthesp.blogspot.com/2015/07/modeling-highway-trucks-part-2-semi.html ). In this post I will continue with more modeling of semi-trailers. A point I have not raised earlier but worth mentioning is capacity of these trailers. 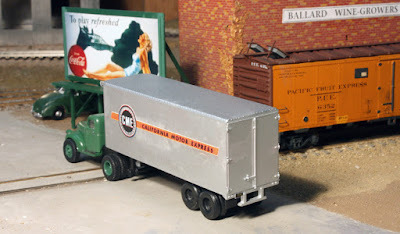 The Classic Metal Works (CMW) 32-foot Aerovan trailer, shown in the previous post (link above) has a single rear axle, all right for local delivery and other light assignments, but not likely for heavier intercity work. A dual-axle bogie like the ones under the Ulrich trailers would be more appropriate. But there is a better source. Modelers of a certain age are almost certain to own a few of the old Athearn 24-foot trailers. 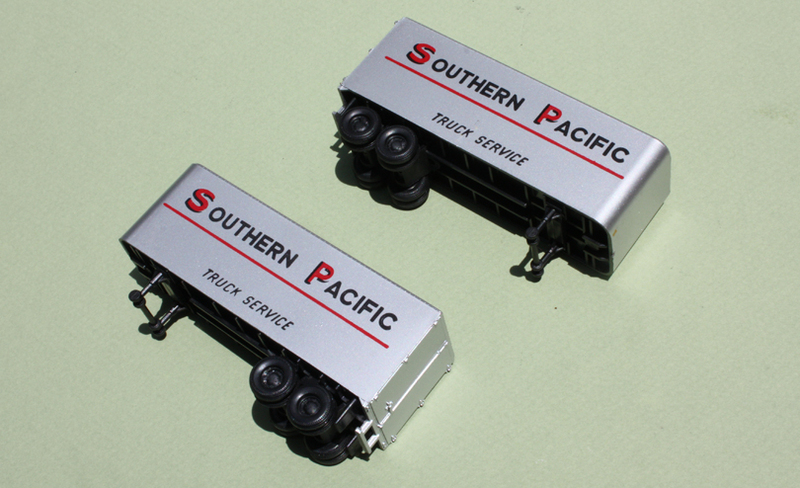 Though simplified, these are decent models of short trailers for anyone who is not really a truck modeler. Here is a pair of them. The paint scheme shown postdates my modeling era of 1953, so the lettering shown is unwanted for my layout. This lettering comes off quite easily with a Q-tip and some rubbing alcohol. But to anyone who knows trucking, there is one glaring oddity about this model: its dual-axle rear wheels. 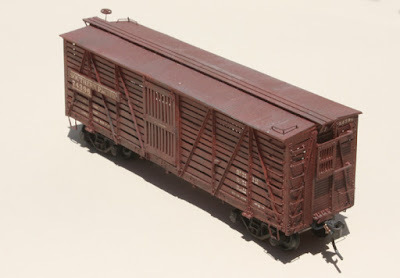 That application was rare in short trailers like this, which were used mostly for pick up and delivery, and perhaps resulted from Athearn wishing to make the model look more substantial. A single axle would be much more typical (Paul Koehler is one of those who pointed this out to me). Of course I just mentioned the CMW trailer that should have two axles instead of one, so why not swap? 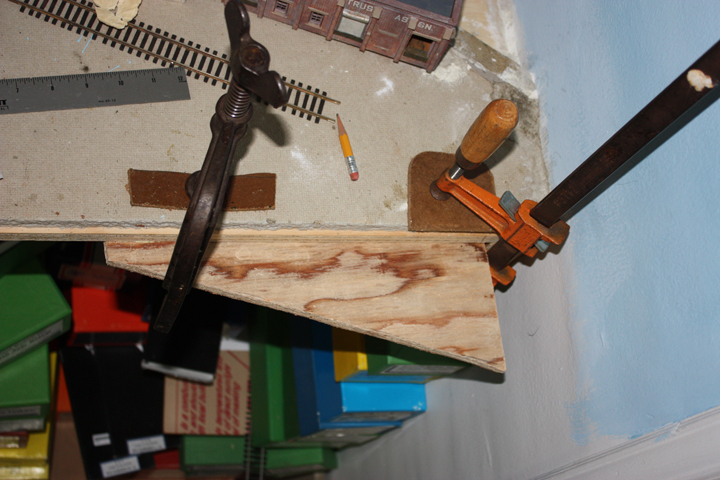 A razor saw makes short work of removing the Athearn bogie flush with the underframe of its trailer. Then I used a razor blade to carefully cut the mounting posts of the CMW trailer single-axle bogie. Each can now be glued to the other trailer. I used Plastruct “Plastic Weld” cement for a secure joint. This bogie exchange permits a more realistic set-up of the Los Angeles – Seattle Motor Express (LASME) rig I showed in the previous post, now using an Ulrich Kenworth tractor, as would be typical for over-the-road hauling. The 32-foot CMW trailer now has two rear axles. 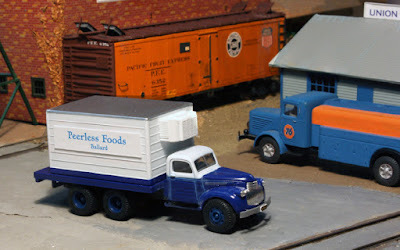 At the same time, the revamped Athearn 24-foot trailer with a new single axle looks better behind the CMW 1941-46 Chevy tractor, a lighter hauler and appropriate for, say, city delivery. I stripped the paint from some of my Athearn 24-foot trailers and repainted them other colors, such as white. The Coast Truck Lines trailers shown below was made with another Graphics on Demand lettering set (you can visit them at: http://store.graphicsdemand.com/ ), with the trailer converted to a single axle and hauled by a CMW Chevy tractor. (It’s not yet weathered.) This single axle is from a CMW trailer, but it is even easier to simply slice off the forward axle on the original Athearn bogie. I said a little about paint schemes in the previous post. To expand on that, here are three of the original Ulrich trailers I’ve collected. They are lettered for Illinois California Express, Garrett Freight Lines, and Denver Chicago Trucking Company. 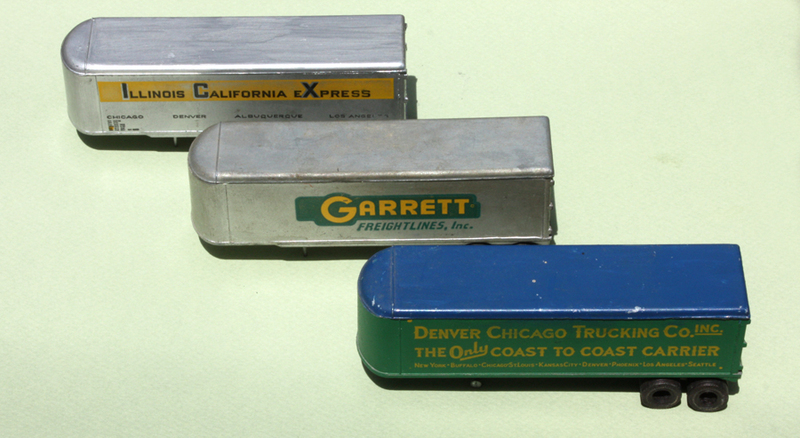 All three represent active motor carriers in the 1950s, which I model, and all were Western companies or served the West. At least one side of each trailer will be kept as it is, though a couple of them may get other lettering on the “other side” of the trailer. I’m pretty sure the blue roof on the Denver–Chicago trailer is the product of someone’s imagination, but it’s easy to correct. These model trucks are not intended as exact models of their various prototypes, certainly less rigorous than my railroad freight cars, but they supply one part of the highway vehicle fleet that shows on the roads of my layout. 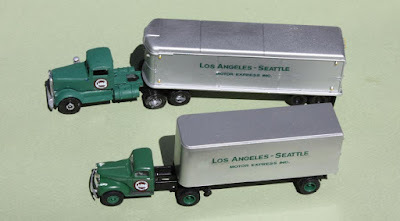 In Part 1 of this series about models of highway trucks (it is available at: http://modelingthesp.blogspot.com/2015/07/modeling-highway-trucks-part-1-box.html ), I discussed a few models of van or box trucks. In this post, I want to talk about semi-trailers. The first issue for a modeler of semi-trailers is era. In the 1950s, when I model, the length of tractor-trailer combinations (not trailers alone, as is the case today) was regulated, but separately by each state. Western states tended to permit longer vehicles and also heavier ones. One result of limitations on total vehicle length was the development of the cab-over-engine or COE tractor, which minimized tractor length, thus permitting longer trailers. The common trailer length in my modeling year of 1953 was 32 to 35 feet, though both longer and shorter trailers were in use. There is a wealth of historical information on the Internet about this topic, and I would encourage interested modelers to explore there. I will illustrate one of the kinds of used Ulrich models you can find with this photo, lettered for what I believe to be an imaginary circus. The Kenworth tractor is missing its exhaust stack, but that is easily replaced with tubing. Likewise the missing mud flaps on the trailer are easy to add with sheet material of several kinds. Since I’m not modeling any aspect of the circus world, I stripped the trailer paint, then repainted it flat white. A word on colors and paint schemes. There are lots of period photographs on the Web of historic semi-trailers, though in black-and-white photos it can be hard to discern colors. Many trailers in the early 1950s were lettered over natural aluminum, though many others had a base color of white or other colors. Some trucking companies apparently operated both white and silver trailers together. One of the excellent sources of photos, which I’ve used extensively, is Hank’s Truck Pictures (at: http://www.hankstruckpictures.com ). This site is organized according to trucking companies, a very helpful arrangement. An excellent source of lettering for trucks, for eras ranging from the 1940s to today, is Graphics on Demand, in Wenatchee, Washington. They are not water-slide decals, but are very thin adhesive vinyl sheets, which work fine. Applying them is a little like a dry tranfer, with the same kind of burnishing process. You can see their extensive HO scale line at the following web link: http://store.graphicsdemand.com/ . I have purchased a couple of batches of graphics (mostly from their “Motor Carriers” section), and am very pleased with the prompt service and fine product. Here is the former circus trailer, as redecorated, with the same Kenworth tractor. 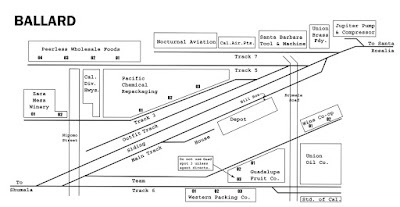 This scheme for West Coast Fast Freight can be documented at Hank’s Pictures (link to: http://www.hankstruckpictures.com/kg_wcff.htm ). Just for a comparison, I wanted to decorate one of the fine Classic Metal Works or CMW 32-foot Aerovan trailers. These have a side door, as was common in the 1950s for delivery service. The trailer does have a prominent pair of ridges down each side, which I thought could interfere with the addition of graphics, so I tried removing them on one trailer. I simply used an X-Acto chisel blade. The removed ridges show as gray stripes in the photo above. I touched them up with Old Silver, which made a good match in tone, though somewhat brighter a silver color than the CMW paint. I lettered one side for Los Angeles – Seattle Motor Express, a company which operated up and down the West Coast before being purchased in 1959 by National. The other side, with the delivery door, I lettered for Lucky Lager beer, which by the late 1950s was the best-selling beer in the West. This is all Graphics on Demand lettering. The tractor is the CMW 1941–46 Chevrolet, and its LASME door emblem is from the same Graphics on Demand set as the trailer lettering. Joining these two trailers is a Pacific Motor Trucking scheme, custom painted by Jim Elliot on a Tyco ribbed trailer and an International R-190 tractor made by CMW. Jim used the Microscale PMT decal set for this vehicle. With these trailers completed, I can put them on the layout, and can in some cases mix and match with some existing tractors I have. In a future post, I will show more trailer development, along with some comments on tractors. Although the freight movement we want to depict on a model railroad is mostly via railcars, it is still the case that our model roads and highways should contain highway trucks. I have approached these truck models in a couple of ways, and thought it might be useful to describe a bit of what I am doing. One category of model trucks would be delivery trucks. These are normally what the industry calls “straight trucks,” “box trucks,” or “van trucks,” of a range of sizes. These have been available over the years in many forms (Varney did them back in the early 1950s, and in that era and ever since, many manufacturers have offered these vehicles). Among the fine truck bodies of this type have been the recent Athearn van trucks. I like to choose familiar national or regional company names for such vehicles. Here is a Bekins-lettered Athearn box truck, on Bromela Road in Ballard on my layout. 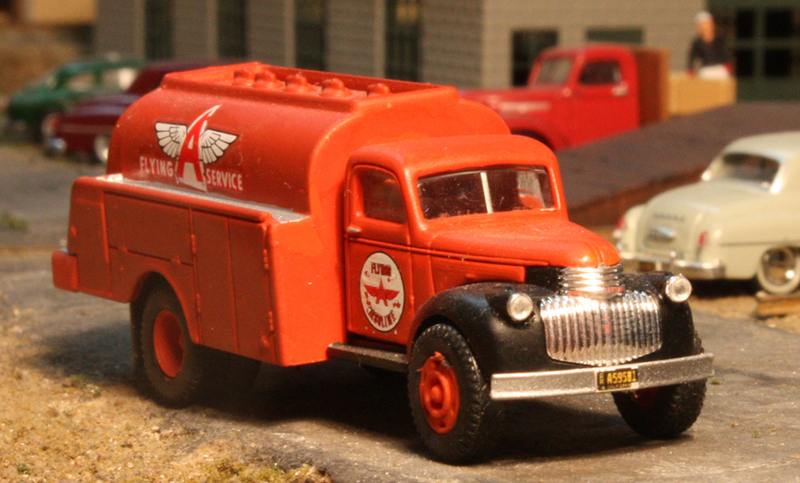 Another example, from the CMW line of ’41–46 Chevrolets, is the tank truck, one of which I have decorated for Associated Oil, using the “Flying A” logo. This truck would of course be occupied in making deliveries from my rail-served Associated dealership in Shumala, another on-line industry. It’s seen here on Nipomo Street in Ballard on my layout. This truck, of course, has a correct “commercial” California license plate for 1953. I discussed this and other California vehicle plates in a prior post (see it at: http://modelingthesp.blogspot.com/2012/12/vehicle-license-plates-trucks.html ), along with a broader discussion of automobile plates (you can read that post at: http://modelingthesp.blogspot.com/2012/11/vehicle-license-plates-in-ho-scale.html ). More on this topic will be appearing in the forthcoming August issue of Model Railroad Hobbyist or MRH, available free for on-line download. Lastly, I should mention SP’s own subsidiary, Pacific Motor Trucking or PMT, with its trucks painted in unmistakeable Daylight colors. This particular model was painted by Jim Elliott, and it can often be found at the depots on my layout, making pickups or deliveries. It’s another CMW truck, this one a White Model 3000 cab-over, a model introduced by White in 1948. It is shown on Chamisal Road in Shumala. The larger highway trucks, almost always semi-trailers, are also quite interesting, and I will address them in a future post.